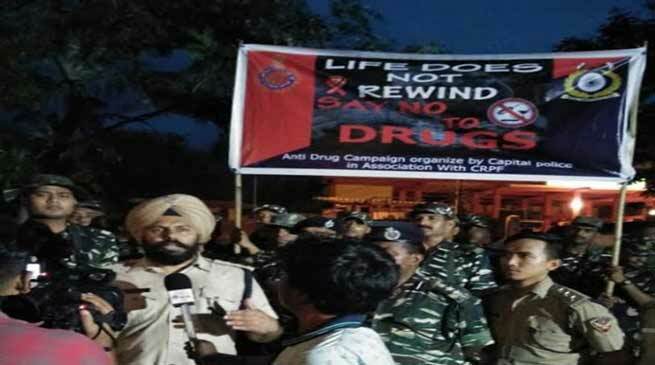 Capital Police led by SP, Sagar Singh Kalsi today carried out march in the road of Itanagar to draw the attention of the denizens on ill effect of the drugs. Addressing at several location in his way from Capital SP office to RK Mission and then to AP Civil Secretariat urge upon the city seeking to educate their family members on the ill effect of drugs and affect on healthy life including economic condition of the family members and other problems which arise due to use of drugs by youths, students and others. The programme was held on the occasion of International day of the families which was participated by the members of the capital Police and CRPF, SDPO Kamdam Sikom and all ranks of the capital police of the township and Paras Nath, Commandant CRPF 138Bn.